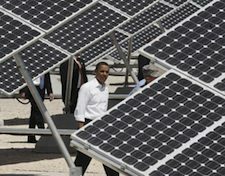 The Obama administration finally agreed to assemble solar panels on the roof of the White House. It’s encouraging news, considering that Congress was unable to pass climate change legislation this year. While Congress may not get it, citizens across the country have committed to building green using energy-efficient guidelines such as LEED (Leadership in Energy and Environmental Design), a rating system set out by the U.S. Green Building Council. Green buildings are no longer reserved for the wealthy or the province of distant countries. They are becoming a well-traveled path to a sustainable future. Consideration of inward, rather than outward, urban development encourages major cities to be more self-contained and sustainable in the realms of energy and water usage. Inclusion of building features such as solar panels and energy-efficient window and wall insulation insure that energy is self-produced and not wasted. Activist Bill McKibben and 350.org led the campaign to reinstall solar panels on the White House. McKibben and several college students began their road trip in Maine and delivered the panels on Sept. 10. The the solar panels were rejected at first because the administration did not want to “give the right another talking point comparing Obama to Jimmy Carter,” writes Salon. But the Obama administration changed its stance and accepted the two panels Oct. 5. Beth Buczynski of Care2 has the story. Although the installation of the solar panels is encouraging, it doesn’t change the fact that Congress has not passed any substantial climate legislation this year. Furthermore, President Barack Obama faces an uphill battle with Congress regarding the regulation of carbon emissions, according to Agence France Presse in AlterNet. Yet sustainable development has gained momentum, despite a lack of congressional backing. Cities such as Portland and Seattle have championed self-sustaining, inward development, while Chicago is building its first pre-fab home this fall. LEED is a common, third-party evaluation of a building’s environmental sustainability. The rating system measures carbon emissions, water conservation, energy efficiency and consciousness about materials and resources used for the project. Additional building standards have also emerged. Architect Jason McLennan has created the “Living Building Challenge”, which requires new structures be self-sustaining in regards to energy and water usage. Jonathon Hiskes of Grist writes that although the rating system is more strict than LEED, around 70 buildings have striven to meet the challenge. Congressional members and ecologically concerned citizens should look abroad for the best examples of sustainable building initiatives. Tianjin, China, the country’s third largest industrial city, began construction of one of the country’s first eco-cities. The proposed city, which would be 11.6 square miles, would house a population of 350,000 and include contributions of sustainable building material from Japanese company Hitachi and Dutch company Philips. Siben Linden, a well-known German eco-village, is composed of straw buildings that serve as multi-family homes for around 80 adults and 30 children, according to Athena and Bill Steen of Chelsea Green. The village is agriculturally self-sustaining and is powered by photovoltaic systems. As a result, the total carbon emissions equal about 10 percent of the average German energy usage. The future may seem far away, but with regards to sustainable development, it’s closer than we think. Congress just needs to realize it. Thank you for the blog. I have worked to make our pest control business more green and sustainable. I’d love to see more posts that include tips for homeowners and business owners. Thanks. So, the Chinese are developing an “eco-city” which will have 30,000 people per square MILE! That is a LOT of people. You’d have to have nothing BUT hi-rise apartments, which are a B—CH to get into or out of if you are a non-athlete if there is a power outage, and it is hard to build them so that they are earthquake-resistant. And the way the Chinese have been building, their edifices do tend to collapse or fall over whenever there is a major earthquake. Only an environmental extremist who hates people and only cares about “nature” and “the environment” and WANTS people to die in huge numbers to “save the planet” would approve of THIS idiotic and savage scheme. And we are talking about a COMMUNIST government’s word, here, and Commie governments have an almost uninterrupted history of LYING. They also have a history of killing MILLIONS,and if the Communist government of mainland China can force their people to move to these massively overcrowded “eco-cities”, ESPECIALLY the “malcontents”, it would be,to them, a GOOD thing if there are lots of lives lost. “For the good of all”, as they say.Even without an earthquake, any kind of epidemic would spread like wildfire. I DO hope this notion dies on the vine.